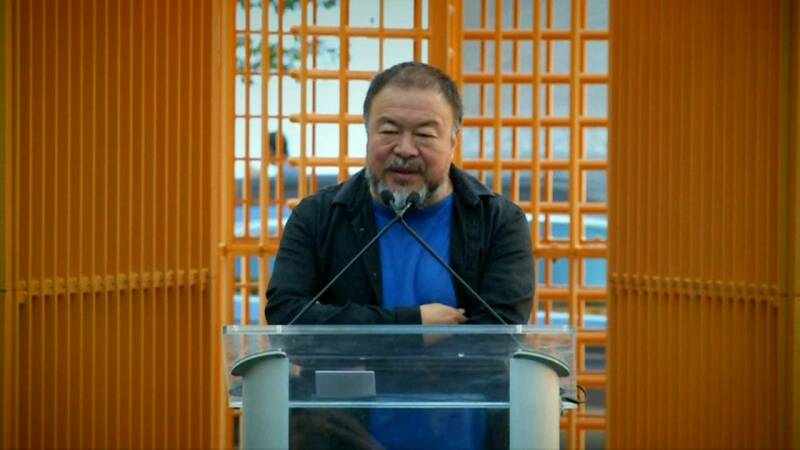 A massive sculpture resembling a golden cage sits on display at the southeast entrance of Central Park in New York created by the Chinese artist and human rights activist Ai Weiwei to bring attention to the global migrant crisis. The work, titled ‘Gilded Cage’ is part of Ai’s city-wide exhibit ‘Good Fences Make Good Neighbors’, featuring more than 300 installations and multiple large-scale, site-specific works such as ‘Gilded Cage’ in Manhattan and the ‘Circle Fence’ at Flushing Meadows-Corona Park. Ai, who resided in New York from 1983 until 1993 said it was his “privilege” to make New York – one of the most diverse cities in the world – his canvas. The multi-site, multimedia exhibit ‘Circle Fence’ is made up of metal posts of different heights, adding a playfulness to the work functioning as hammocks for passersby. Connecting the posts are 300 metres of mesh netting, circling the iconic 43 metre steel representation of the earth – symbolising the current geopolitical state of the world. “(Leaders are) trying to separate us by colour, race, religion, nationality which is I think completely going backwards against freedom, against humanity, against our understanding of our time. So I made a work in relation to this issue,” said Ai. ‘Gilded Cage’ was strategically placed just a couple of blocks from Trump Tower, and Ai said that U.S. president Donald Trump, whom he sharply criticized for his immigration policy and border wall, is welcome to enjoy his work. “I made this sculpture gold to please him,” he said. Banners spanning across Essex Street Market’s façade is another site-specific work titled ‘Exodus’ and tells the story of the perilous journey of refugees. The exhibit also includes sculptural ‘interventions’ such as metal additions to 10 bus shelters around the city, as Ai sees transportation as a key component in the conversation around migration and refugees. The structural add-ons have additional seating, functioning both as art and urban amenity. Other works include 200 unique banners that will appear on lampposts across all the five boroughs, and a series of 100 documentary images from Ai’s research at refugee camps which will fill spaces traditionally used for advertising. Ai hopes that each work will draw attention to the role of the fence in dividing people, and how it alters our perception of the environment in which it is placed.